This solid side futon frame, a perfect balance between strength and style, is our finest work and a most exceptional value. The wider top is great for a drink and this taller arm sits higher than most futons, which is especially important with today’s thicker futon mattresses. And our customers really like the solid end as it looks less like a traditional futon – classic V-groove solid panel represents a level of timeless craftsmanship unheard of at this price. Ships easily in two boxes and comes with everything you need to set up your futon in a flash. We’ve all had one, or at least handled one along the way. You wouldn’t think much about a futon unless you’ve had to choose one or use one. Turns out there are many details regarding futons…cost, comfort, ease of shipping or pickup, how to operate one, what kind is best, etc., etc…We’re here to help simplify your options. The majority of futons are made and sold in a full size that will open up into a full size bed for sleep and double as a couch as needed (although they do come in other sizes). There are three things needed for a futon setup, regardless of size or style: the frame itself, the mattress that goes on the frame, and the cover that goes over the mattress. Here we’ll give you some insight into the frames. It all boils down to size and style. The size depends on how much sleeping space you want the futon to provide. They run just like bed sizes. A Twin Futon will open up to be the equivalent of a Twin Size Bed (sleeping space being 38 x 75 Inches). A Full Size will open to be a sleeping space of 54 x 75 Inches, and a Queen Size to open up to be 60 x 80 Inches. The frame will exceed these dimensions by how wide or narrow the Armrest style is. So, once you know the size you like or want, you can focus on your style. Shown here is the EVEREST style. This cottage style futon is stylish yet substantial, and the taller/ wider armrest seems to appeal to those who rely on a substantial armrest regularly. 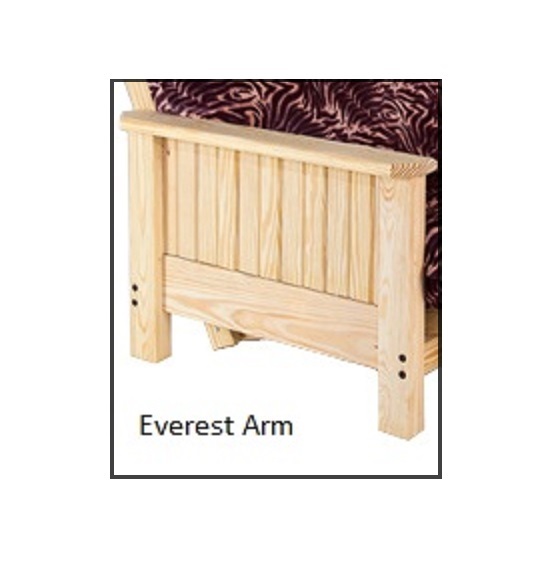 The solid wood side arms provide an opportunity to show off the wood’s grain and lets you accessorize as much as you want with pillows, bolsters and more. The armrest is 24.25-Inches high. *Follow the links above to check shipping rates or to add these items to your cart! As a leading futon expert, Room Doctor manufactures futon frames and platform beds locally in Central Pennsylvania out of sustain-ably sourced Southern Yellow Pine. We absolutely LOVE solid wood and its natural ability to be chemical free, strong and beautiful. We have been manufacturing unfinished futons in unique sizes and style for over 25 years.